"Opportunity is who we are. And the defining project of our generation is to restore that promise." America's public schools strive to offer a path to the middle class for children from hard-working families in every community, particularly those living in poverty. Yet too many students lack access to the education and supports that make the journey to the middle class possible. The Obama administration is committed to ensuring equity of opportunity for every child. In President Obama's first term, the administration helped to unleash innovation at the state and local levels, in part through competitive funds that achieved extraordinary "bang for the buck" in driving positive change with public dollars. This happened even as the administration maintained strong support for formula grant programs, which make up the vast majority of the budget, and are focused on the most vulnerable students. The nation's schools, teachers, and students have made significant gains. These include the highest high school graduation rate in American history, an increase of nearly 50 percent in the number of students accessing higher education on Pell Grants, a major increase in the number of minority students in college, and sharp cuts in the dropout rate, especially for Hispanic and low-income students. Despite this solid progress, wide gaps of opportunity and achievement continue to hurt many minority, low-income, and other underserved students, potentially imperiling our nation's economy and our future. The President's budget request reflects his strong belief that education is a vital investment in the nation's economic competitiveness, in its people, and in its communities. The administration's request for $69 billion in discretionary appropriations represents an increase of 2 percent over the previous year and slightly more than the 2012 discretionary level for education before the sequester. Three-quarters of that funding goes to financial aid for students in college, special education, and high-poverty schools (Title I). 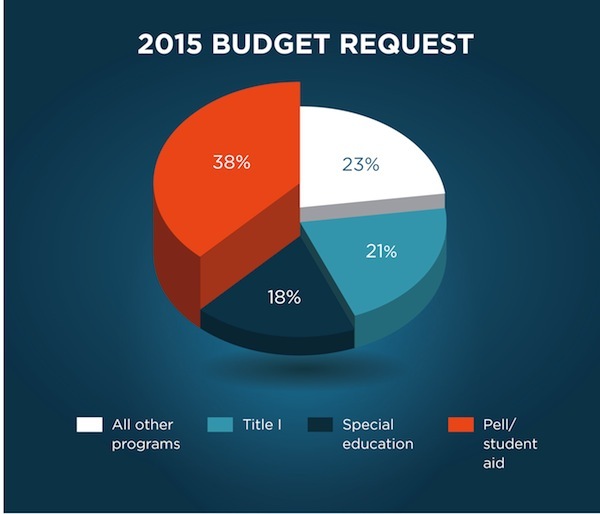 The remaining 23 percent of the budget targets specific areas and reforms designed to leverage major changes in educational opportunity and excellence for all students, including the expansion of access to high-quality preschool, data-driven instruction based on college- and career-ready standards, making college more affordable, and mitigating the effects of poverty on educational outcomes. Much of this leverage is achieved through competitive awards to states and school districts committed to educational innovation and transformation. 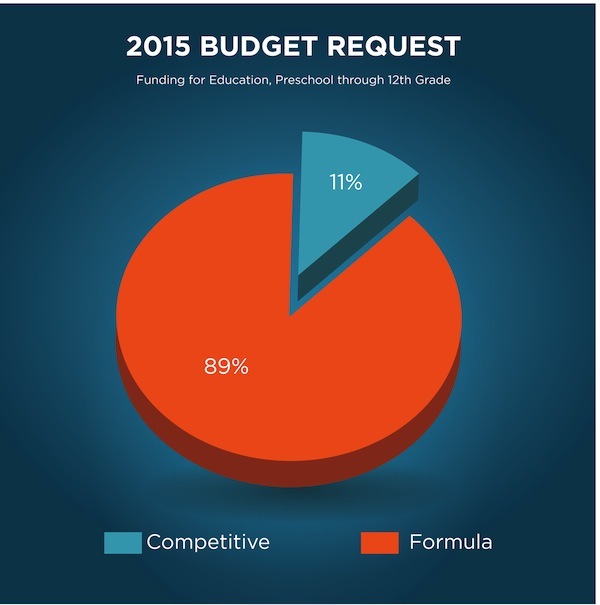 But the lion's share of the 2015 request—nearly 90 percent of discretionary spending—goes to formula funds that address the needs of disadvantaged poor and minority students, students with disabilities, and English learners. Despite major progress for America's students—including significant jumps in college enrollment and cuts in the dropout rate for minority and low-income students—deep gaps of opportunity and achievement endure. The Obama administration is committed to driving new energy to solving those problems. Nearly every element of the federal education budget—from preschool funds, to Title I, to special education funds, to a coordinated set of K-12 reforms, to Pell grants—aims to ensure equity of opportunity. Moreover, equity is a chief focus of competitive funds and other actions introduced in the Obama administration, including Race to the Top and ESEA flexibility agreements with states, which have helped to provide states with relief from some of the more overly prescriptive and burdensome aspects of the No Child Left Behind Act. A new proposed fund, called Race to the Top-Equity and Opportunity, would complement existing efforts by further supporting strong state and local efforts to improve equity. It would create incentives for states and school districts to drive comprehensive change in how states and districts identify and close opportunity and achievement gaps. Learn more about this fund and about progress in ensuring equity of opportunity. Just as every child, regardless of geography or income, should have access to outstanding teachers and leaders, all educators should have the resources and support they need to provide effective instruction and to personalize students' learning. Technology can help teachers do this, but technology alone cannot improve student learning. Teachers and school leaders must know how to make the best use of technology. The new ConnectEDucators proposal would provide funding to help educators leverage technology and data to provide high-quality college- and career-ready instruction that meets the needs of all students. Learn more about ConnectEDucators and the administration's teachers and leaders plan. Equity of opportunity also means ensuring all children have rich early learning experiences so they are better prepared to thrive in school. We know from decades of research that high-quality early learning can significantly improve long-term educational and life outcomes, especially for children from low-income families. Yet fewer than a third of the nation's 4-year-olds are enrolled in high-quality preschool. In one of the boldest efforts to expand educational opportunity in the last 50 years, President Obama has committed to a historic new investment in preschool education that supports universal access to high-quality preschool for all 4-year olds from low- and moderate-income families and creates an incentive for states to serve additional middle-class children. The President's budget request includes $1.3 billion in 2015 and $75 billion over 10 years in mandatory funding, along with $500 million for competitively awarded Preschool Development Grants and other funds. Learn more about Preschool for All. Improving college access and completion is an economic necessity and a moral imperative. Few good career options exist for those whose education ends with high school, since most jobs that pay a middle-class salary require a college degree. College has long represented the surest route to the middle class—but the middle class is increasingly being priced out of college. Nearly half of students who begin college in this country never finish and, for low-income students, the completion rate is less than one in ten. America once ranked first in the college completion rate of its young people; we now rank twelfth. Reclaiming the top spot in college completion is essential for maximizing both individual opportunity and our economic prosperity, which is why the President has made increasing college affordability and improving college completion a major focus of his 2015 budget. Learn more about making college affordable. Schools are, generally, the safest places in America, but the nation's conscience has been shocked by acts of horrific violence in schools. While these acts have changed communities forever, less dramatic moments of violence each day decrease students' sense of security, which is essential to their healthy growth and learning. In response, the President's plan to increase school safety and to decrease gun violence includes investments not only to prepare schools for emergencies, but also to create positive school climates and help children recover from the effects of living in communities plagued by persistent violence. In addition, new guidance from the Department aims to help schools address disproportionate rates of suspension and expulsion for minority and special-needs students. Learn more about school safety and about new guidance on school discipline.